Whether you knew it or not – a truck driving job is a federally regulated profession. These federal regulations take some of a driver’s personal life into consideration, including the use of prescription medication. What do you need to consider when receiving a prescription medication? 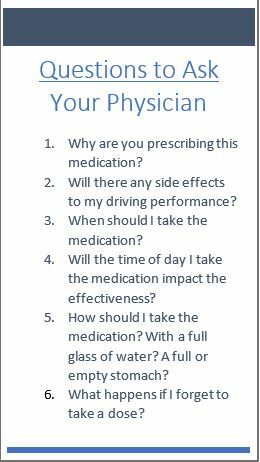 What questions should you ask your physician when receiving a new medication? What should you disclose to the DOT medical examiner at your annual or semi-annual physical? First, consider how your ability to drive is important to the safety of all you share the road with. As such, it is important to take that responsibility seriously. Prescription medication may impact your driving. It is up to you to learn whether the impact is positive or negative. It is important that you inform your physician of every medication you take. This includes vitamins, herbal supplements, aspirin, prescription and non-prescription medications. Not all substances react well together. Therefore, if you are taking certain herbal supplements, you may be unable to take SSRIs. Your doctor is one person specifically that you never want to hold out on. If you fail to completely inform your physician you risk your medication not working, or worse, having a severe reaction, putting others in danger when you drive. No one wants to be crossing over state lines alongside a driver who may be too impaired to properly operate their vehicle, nor does any family want to pull out of a diner in Michigan as a stop along their road trip and be confronted by a driver who illegally consumed medication behind the wheel. If you have a certain condition that you take medication for, but forget to take your medication with you before leaving on your run, you have options available. One option that you should never exercise is that of using another's prescription medication. You do not know what side effects those pills may have on you. If it is the same prescription but a different dose even, it could be detrimental. You do have two choices should you forget your medication. If you use a chain pharmacy you can easily have your prescription transferred to the location you are at. You can even go so far as to ask for only a few days’ supply. The other option is to call your physician’s office and ask them to call in a prescription to a local pharmacy for you. That called in prescription can be just a few days’ worth as well. During your annual (or semi-annual) DOT medical exam you need to inform the physician of all medications you are taking, over-the-counter and prescription. The reason for this is somewhat different than why you tell your personal physician. When the DOT medical examiner runs a drug and alcohol screen, that test will pick up many things. It is important the physician has an idea of your level of health on the road and what you are taking so that the correct information regarding your qualifications can be determined. What happens if you are medically unqualified? That means you are not cleared to drive a commercial motor vehicle. Your license is not revoked, but your medical certificate is. Without a medical certificate, you are as good as grounded. Any one of the side effects from narcotics has the potential to be fatal to you and others you share the road with. The best way to prevent being prescribed something harmful to your trucker job is to make sure your physician knows you are a commercial driver. If your physician is unfamiliar with the regulations you are bound by, give them a summary of what you do each day. If the physician suggests a medication that you know to be harmful, ask for alternative treatments that would be in line with one’s occupation. Make sure you know what the side effects of all forms of treatment. If you suffer from a long-term illness (i.e. diabetes or high blood pressure), investigate what changes you might make to reduce your dependence on, or come off from completely, any medication. Your physician will be able to inform you if there are any dietary or exercise changes that could aid you. If you are on a medication that has disqualified you from driving, discuss with the DOT medical examiner what options are available, such as exemption programs. Some disqualifying medications include ant-seizure medication, as is any use of medication classified as methadone. The following, issued by the DEA, defines drugs in certain categories and spells out which categories of drugs are illegal to use and illegal to truck while having used. (a) "Schedule I shall consist of the drugs and other substances, by whatever official name, common or usual name, chemical name, or brand name designated, listed in this section. Each drug or substance has been assigned the DEA Controlled Substances Code Number set forth opposite it" - in other words, there's little to no wiggle room in categorizing drugs outside of the distinctions already formed. (b) Opiates: "Unless specifically excepted or unless listed in another schedule, any of the following opiates, including their isomers, esters, ethers, salts, and salts of isomers, esters and ethers, whenever the existence of such isomers, esters, ethers and salts is possible within the specific chemical designation" Other than posing a danger on the road, some other side effects may include drivers having a supreme difficulty in withdrawing from these drugs, making an OTR route that much more difficult to manage while nursing an addiction. (c) Opium derivatives - codeine, oxycodone, oxycontin and morphine are all recognized as opium derivatives. Furthermore, they are considered to be among the most abused within the opium family. Luckily, m,any experts agree that the trend of this particular drug abuse within the trucking community has plummeted. (d) Hallucinogenic substances. "Unless specifically excepted or unless listed in another schedule, any material, compound, mixture, or preparation, which contains any quantity of...hallucinogenic substances" - There may not be many on the road who are using chemical compounds like LSD, PCP or Mescalin, but these are considered to be among the worst offenders, and for good reason. 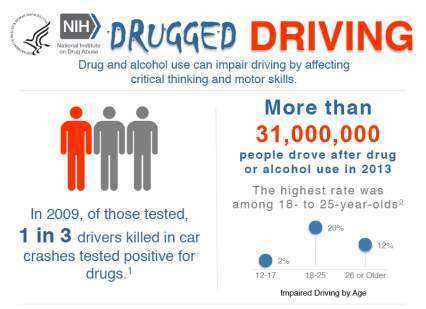 Aside from greatly depressing the central nervous system, these drug greatly impact a driver's visual sense, making them incredibly dangerous on the road. (e) Depressants: "Unless specifically excepted or unless listed in another schedule, any material, compound, mixture, or preparation which contains any quantity of the following substances having a depressant effect on the central nervous system" - this, of course, includes alcohol, while also including opioids and the cannabis family. (f) Stimulants: While stimulants such as caffeine and nicotine are rarely outlawed in the cab, there are stimulants that are clearly illegal. Stimulants such as methamphetamine, cocaine and MDMA fall on the other end of the spectrum, with no known consumption levels that are considered "safe"
(g) Cannabimimetic agents: This category falls into a much more chemical-based discussion of the above drugs, yet qualifies in as illegal in the Schedule I ruling of drugs. For more information on this, visit the DEA's website. What about medical marijuana? As of this writing, all but six states throughout the U.S. have some form of a medical marijuana law – Texas is among those. No matter the state’s particular law may be regarding marijuana usage and possession, a commercial driver is automatically disqualified to drive a CMV if using marijuana, legal or not. What that means is that for states such as California where recreational marijuana is legal in certain respects or Florida where medical marijuana is legal, the rules of trucking and the DOT regulations nonetheless reign supreme. Prescription medication are sometimes necessary for a person to get well. Yet, not all prescriptions are safe for a commercial driver to take while working. Be an informed consumer. That means being aware of your options, be it different types of medications or alternative treatments for your condition. Be honest with your doctor and management team. Don't let withholding of information potentially get in the way of your record on the road. Being an informed consumer also entails being wise about where you obtain your information. The Internet is a remarkable tool, however, not everything on the Net is accurate. Use discernment. Never make a decision without speaking to a qualified medical physician. If you find yourself to be unqualified, be honest with your employer. If your medical certificate is revoked and your employer finds out from anywhere or anyone other than yourself, you are at significant risk of losing your trucking job. Some employers will be willing to work with a driver who finds themselves temporarily without a medical certificate. Also, work closely with your physician to reverse your situation. The sooner you are back on the road, the happier you will be. However, if you find yourself with a permanent disqualification, there are other opportunities within the transportation industry. You might consider safety officer, dispatcher, router, supervision, and/or trainer. Don’t give up, the best is yet ahead!